Not all pool covers do the same thing. Solar Covers (sometimes called bubble blankets, floating bubble covers and even bubble wrap covers), are generally used primarily to heat the water and to stop evaporation. Fitted covers are usually used for a more long term covering, or when there are a lot of leaves in the garden. Regardless of which style is best for you, you will save time and money when you cover your pool. Use a pool cover, and you will save water, cut your chemical consumption in half, and reduce maintenance by helping to keep leaves and debris out. Find out which pool cover suits your needs best below. Click HERE for instructions - "HOW TO FIT YOUR NEW POOL COVER"
Save water, cut chemical consumption and heat your pool with these simple floating covers. Quick and easy to handle when used with a roller system. This bubble style floating blanket provides all the water saving benefits of a solar cover, but does not heat the pool water. Cuts evaporation, and keeps leaves and debris out of an above ground pool. This value for money 'shower cap' style cover is easy to use. Talk to us about your requirements - indoors, outdoors, heated or non-heated – we’re here to help! A foam spa cover will reduce water evaporation and heating costs. 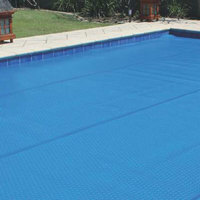 Triple Cell is the first purpose designed and manufactured pool blanket. It breaks away from the traditional ‘bubble wrap’ style and its associated problems.